Lieutenant-Colonel Robert Lowndes ASPINALL, DSO. Cheshire Regiment, formerly 15th (The King's) Hussars and 3rd and 11th Battalions the Yorkshire Regiment. Son of Robert Augustus Aspinall, J.P., D.L. Killed 6 July 1916. Aged 47. Buried BOUZINCOURT COMMUNAL CEMETERY EXTENSION. Lt-Colonel Aspinall was a distinguished soldier of the Yorkshire Regiment, commanding the 3rd Battalion at the outbreak of war and shortly afterwards taking over command of the 11th Battalion. A very full description of his career is provided in the DNW Auction Medals website. 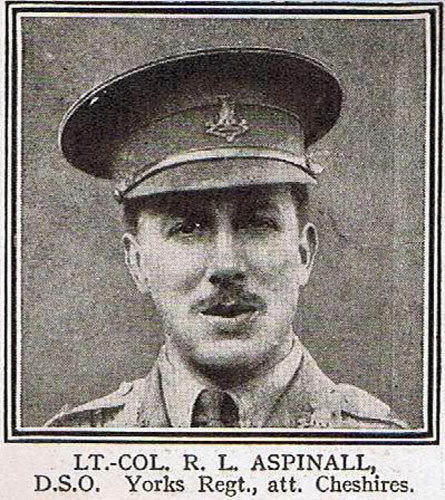 The photograph of Colonel Aspinall has been provided by "Atnomis" on the Great War Forum website.